Next Monday it’s the International Day of Books – St. Jordi, a huge celebration in Catalonia. So what better than discussing books today? And did you know Origin by Dan Brown takes place in Barcelona? Or should I say for the most part, as it also takes you to the Guggenheim museum in Bilbao (Basque Country) and some royal sites in Madrid. But its cover depicting the Sagrada Familia spiral stairs, made me think it was going to be much more focused in Gaudi, the famed Barcelona architect, than it really is (and yes, because I’m a private guide and I wanted it to be about Gaudi). However the Gaudi’s sites are just used as a unique landscape for all the intrigue that happens in the book, and the author doesn’t dig much into the architect’s philosophy, engineering or creations (although you can feel how much he praises him). Anyway, it’s a fun book! (TIP: you can get it on Amazon and Itunes). And so from here on – SPOILER ALERT – I’ll be discussing what’s real and what’s fiction in Dan Brown’s book. And let’s start with the chore of the story: the 47 character sentence was one of my big disappointments. Ok, I know, it was meant to be a line of a poem and the Gaudi quote that immediately came to my mind is NOT from a poem, even if it’s totally related to the title of the book: Origin. So when I saw it reproduced in chapter 52 I thought “Bingo!” after confirming in English it’s exactly 47 words if we include the spaces. Maybe calling it poetry was just a reference to the beauty of the sentence? It’s not a clear prophecy either… or could it be? I have to say I would have loved it to be the password but… it wasn’t. Was it Brown’s trick to fool smart smart alecks like me? Who knows? In any case you’ll have to read the book to know what Gaudi quote I’m talking about and what was the final right password (not Gaudi related, sigh). The book starts with main character Edmond Kirsch heading to the Mountain of Montserrat to meet 3 prominent religious leaders in the Monastery that is located half way to the top of it (not the mountaintop as per the book – no big deal here, it’s a poetic license). He takes the rack train to get there (after reading the book I wonder why he didn’t ride his fabulous Tesla there, but exiting a train makes the scene more mysterious). Next, visitors to the Monastery will quickly realized that the scary cliffs described by Brown aren’t really seen so much from the upper train station or even from the monastery, but rather from the road or the train itself – another poetic license that made me smile. Finally, there is an impressive private library in the monastery, but I wouldn’t call it forbidden or secret. It is true however, that only researchers and other people authorized by the monks are allowed to visit it. 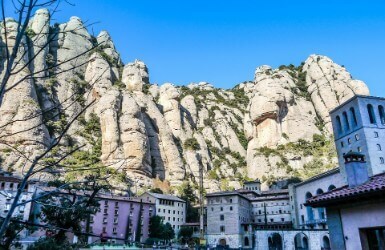 Hey, did you know we organize private tours to Montserrat? This spectacular park is only briefly mentioned on Chapter 49 when Langdon and Ambra Vidal are driving to Kirsch’s home. Definitely the author has wanted to mention it no matter how, because the park outline can’t be seen at all from the road from Sabadell, not even if you take the winding Carretera de l’Arrabassada across the Collserola mountains instead of the faster C-58 freeway. And it’s not a convenient stop either for Edmond’s rides from the airport to the city center. Anyway, I’m happy that Dan Brown uses it to introduce Gaudi for the first time in the book, since from then on the architect will be mentioned quite a few times and he gives some good background knowledge to help readers understand what’s coming next, even if they haven’t been to Barcelona before. Just one think I want to state: there is no “undulating white wall” in the park: it’s an “undulating white BENCH” instead, covered in colorful mosaics that mix up with the white. You can see it in our Gaudi tours. 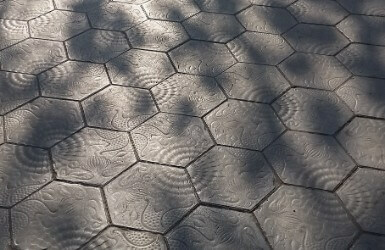 A panot in catalan is a pavement tile, mostly used to pave the streets. The main street of Barcelona, Passeig de Gràcia, is covered in hexagonal panots that put together repeat a complex pattern depicting a star fish (not an octopus like some people say: it’s got only 6 legs! ), a seaweed and a sea shell. They are mentioned also in Chapter 49, little after discussing Park Guell. It amused me that the characters compare it to the “primordial soup”, and even say the locals call it like this – I’m born Barcelonan and I’d never heard it called like this before reading the book. They say it represents ‘plankton, microbes and undersea flora. But of course, mentioning it in the book had to make sense, and the author allowed himself a pinch of fantasy as a tribute to Gaudi – I’m fine with that. But I want to state that those tiles were never commissioned in purpose to pave the sidewalks of the city, as it’s said in the book (unnecessary inaccuracy, Dan!). They were designed for the interior of Casa Batlló, but not being ready on time, Gaudi ended up using them inside La Pedrera instead. And from there, they were copied in the main street produced by the company Escofet in 1971 first in a too large scale, then in 1991 using the original design. The Gaudi building chosen to be Edmond Kirsch’s home is a favorite of mine. This UNESCO site was an apartment building commissioned by the Milà family, who lived in the main floor (third floor for Americans: in Spain buildings have a street level or planta baja, a mezzanine or entresuelo, then the main floor or principal, and only then we start counting flors – what means our first floor is a 4th for Americans!). That floor is now used for temporary art exhibits and has a separate entrance from the rest of the building, where you can visit the spectacular rooftop where Ambra and Langdon are rescued by helicopter, the attic where Kirsch lived – a permanent exhibit about Gaudi’s techniques and inspirations, and one of the rental apartments, now decorated with antiques to teach visitors how living in such a house could be in the turn of the 1900’s. I considered it a bit extravagant to have Edmond live in the attic, but it was fun to imagine that familiar exhibit as a mix of furniture and the models that in the book had been left from the museum exhibit since the computer genius was only leasing it for a couple of years. Actually, even if the attic was originally the place for the laundry rooms, in the 1950’s they were turned into exclusive apartments – not so strange after all to have Edmond moving in! It is also true that the basement of the building was once the first underground parking lot in the city. What unfortunately is fantasy is that it’s still used for cars: it’s instead a press and conference room. And Kirsch wouldn’t have rented it from the UNESCO guys – despite protecting the building, they don’t own it. It currently belongs to Fundació Caixa Catalunya, a private found. One last thing: the catenary hanging model that Langdon admires in the attic isn’t a model of the Sagrada Familia church (wrong, Dan! ), it’s a model of another church by Gaudi: a hidden gem called the Crypt of the Colònia Güell. Maybe the author knew, but preferred not to complicate the explanations with one more Gaudi building not related to the story? In Chapter 65, Ambra and Langdon head to the Sagrada Familia by helicopter (I don’t think there is enough room for a helicopter to safely land in its grounds, specially without being noticed by the many families that live in apartment buildings with their many windows and balconies facing to it just accross the street – but OK, it’ll stop being a pain in the neck, lol). Father Joaquim Beña joins them there. And yes, there is an old priest who has devoted his entire life to the building but his true name is Lluís Bonet i Armengol, son to one of the past chief architects that continued Gaudi’s work after he passed away, after whom he was named: Lluís Bonet i Garí. And brother to another chief architect that just retired in 2012: Jordi Bonet i Armengol. Both Father Bonet and Mr. Bonet, the architect, can often be seen inside the Sagrada Familia church showing around friends and personal guests – and I’m always so excited to point them out to my own clients if we cross them in our tours! As explained in Origin, the Sagrada Familia has three façades: Nativity, Passion and Glory – but visitors today will be disappointed to see that the Glory one isn’t finished (barely started, to be exact) and the demons, sins, virtues and paradise that will be one day decorating what will one day be the main entrance of the basilica are still missing by now. There is indeed a crypt as large as a regular church hidden beneath the altar of the basilica. It can be accessed from the interior of it as well – but just if you have the key, as that access is usually closed and church goers must use a direct entrance from the street that’s only open during worship hours. And yes, Gaudi is buried there but not as close to any of the staircases: you need to walk all around the arched gallery of chapels to find him laying in the very last of them. As for the main basilica, it is even more outstanding in daytime than it can be described by words. The columns were designed to look like a giant forest made of stone, and at night instead it makes you feel like you are lost in a dark forest. And the baldaquin looks like a parachute… but it’s too long to explain here (I explain it in my tours!). As for the stairs where they escape from Admiral Avila… it’s quite dramatic to christen them the “infamously treacherous spiral staircase” as in Chapter 74 and consider them deadly… And no one that is familiar with them would ever chose them as the safe way to escape a killer (seriously! Father Bonet would have known better! He’d take them back to the crypt and let them out through the street door!). But they are indeed steep and claustrophobic, and it’s scary to look down through the hole in the middle. By the way, I’m not sure there’s really enough room for a full sized human body to fall through it… But who cares? It’s an adrenaline-filled part of the story! Not everything in the Barcelona of Dan Brown are Gaudi sites. 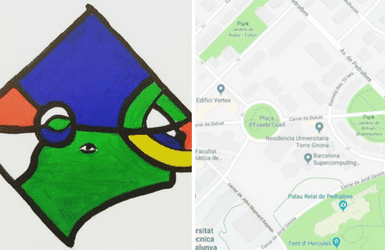 And I must admit I was again fooled here: When they finally figure out they need to head towards the FC Barcelona Stadium somewhere related to a university I got excited: another Gaudi site! the Dragon Gate of the Finca Güell in Pedralbes! But I was wrong, Winston wasn’t in the Pavilions designed by Gaudi as horse stables now owned by the Politecnical University of Barcelona, but a bit further away. Torre Girona was the private mansion of Manuel Girona, banker and major of Barcelona in the late 1800’s, nowadays headquarters of the rector of the Politecnical University. It is true that the desecrated private chapel of the mansion houses the Marenostrum: one of the most powerful supercomputers in the world, and as you can see in the pictures available online, there seems to be enough room on top of it for the second floor that in the book would have hosted Edmond’s computer and office. So what about you? Head to the comments below and tells us: Which of Dan Brown Origin locations is your favorite?